It's no secret that many fans of Dragon Age: Origins weren't pleased with Dragon Age 2. And who could blame them? As a sequel to Origins, Dragon Age 2 buffeted all expectations. Almost every aspect of the game - its scope, combat, even character customization - felt completely different. What the hell happened? Enter Dragon Age: Inquisition. Here, BioWare has struck a more harmonious balance between the size and substance of Origins and the streamlined action of its sequel. The result is what Dragon Age 2 should have been: a bridge, masterfully linking style with substance across 100-hours of high-fantasy goodness. Inquisition picks up shortly after the events of Dragon Age 2. Mages (people with inborn magical talent that also opens them up to demonic possession) and templars (an order of knights dedicated to 'controlling' the mages) are in full-blown civil war against one another. A conclave is convened to try and establish peace between the two, but is cut short by a massive explosion that creates a green, demon-spawning rift in the sky. You emerge as one of the only survivors, with a mysterious power that will let you (hopefully) seal the rift. It's an explosive, if not simple, premise that frees you up to focus on far more interesting personal lives of the people who make up your Inquisition. 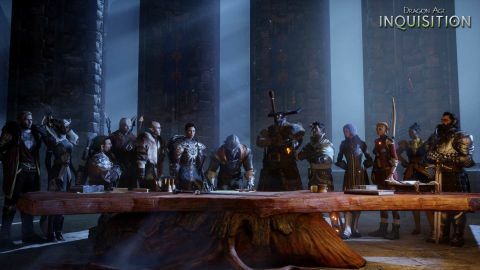 Sharing a pint of ale with Iron Bull and meeting his mercenary company, or listening to Varrick spin colorful tales from Kirkwall, is far more compelling than worrying about an evil hole in the sky. Inquisition puts eclectic, interesting characters at the heart of its story, and through them gives you a deeper understanding of what you're fighting for. However, getting invested in these characters can be tricky if you're new to the series and don't already know a qunari from a darkspawn. Too many of the basics about where you are or who you're dealing with are left to codec entries, which can make it difficult to get immersed in this world. Inquisition is as dense as it is massive, uncoiled from the previous game's cramped city streets and stretched out across two empires. From the marshes of Ferelden to the deserts of Orlais, this game loaded with different regions to explore, each with its own style and expansive landscape. Along the way, Inquisition trips over itself to make sure you always, always have something - maybe a few dozen somethings - to do. These are your typical RPG fare, collect a certain amount of this or kill a certain amount of that, but it's the connections you build with your teammates that gives these tasks weight. You also have greater control over what your characters wear and wield in this game. Crafting and customization exists for all weapon and armor types, letting you decide if you're rogue should have more dexterity or bleed on hit. And unlike DA2, this applies for all party members. It doesn't hurt that combat in Dragon Age: Inquisition feels really good. Part of this is because of the game's vibrant color palette, an upgrade from previous entries. The landscapes are radiant, each drawing from a different set of hues that help set it apart from the rest, and the lighting bolts and fiery explosions your characters wield really light up the arena, adding to the excitement. Whether it's the arcane arts or just a big freaking mace, the weapons all have a certain heft to them that conveys a satisfying senses of devastation. On the strategic side, the top-down tactical camera from Origins is back, giving you a bird's eye view during combat with the press of a button. From this vantagepoint, the action is paused, letting you survey the battlefield and assign orders to your party. You can then speed up and slow down time smoothly with the press of a button, giving you total control of the pace of the fight. This is great for planning out your team's next move, and watching the pieces fall into place is always satisfying. Sometimes, however, the tactical camera just isn't a viable option. Battles will sometimes take place over a wider area than the screen resolution can accommodate, which prevents you from sizing up the fight at a glance. This means having to constantly scroll around the screen hunting for every threat, and building a composite image of the battlefield in your mind. Fighting in close quarters helps alleviate this issue - but tight, enclosed spaces can give the camera trouble when moving around boulders and other obstacles. Thankfully, most of my encounters took place in that sweet spot between large and small. Like many other BioWare games, Dragon Age: Inquisition is one of choices, but this time you're not just some lone hero with his (or her) merry band. On this adventure, your forces are legion, and through them you can move mountains. And by 'move mountains' I mean sign complex treaties and launch military expeditions, but you get point. Such decisions are made at the war council, where you assign one of three advisers - diplomatic, military, and espionage - to address requests from kings and peasants alike. Will you deploy your spies to assassinate a rebel leader, or use diplomacy to help him change his ways? It's international intrigue with a personal touch, that's the Inquisition guarantee. I really like the war council. Deciding which missions to prioritize, reading the after action reports, and just listening to your advisers banter about day-to-day scandals across the empire conveys a sense that you're running a small nation. It feels a bit like being on The West Wing, with the part of the President being played by - in my case - an elven wizard who argues about demonic rifts instead of new legislation (pretty much the same thing, really). As elvish wizard President, you have a hand in everything the Inquisition does. The way people treat you, the decisions you're given, and how you carry yourself all channel the weight and responsibility of your office. My favorite moments, however, are the sentencings. These small vignettes have little consequence on the overall course of the game, but dammit if they don't make you feel like a boss. You sit on your mighty throne - which you can totally customize, by the way - fingers steepled, deep in thought, and conduct a sort of mini-trial. Some defendants are criminals, other are more… complicated, but all will face your judgement. This, along with the war council, the choices you make, and the fact that people start referring to as 'your worship’, all feeds back into the fantasy that you are the boss. And boy does it feel good to be the boss. Even the multiplayer in Dragon Age: Inquisition feeds into your bossiness. You and a mixture of friends, bots, and/or strangers take on the role of an inquisition's strike team on assignment from the war council. If you've played Mass Effect 3's cooperative, Horde-style multiplayer, this will be familiar territory, even though it doesn't quite measure up. Controlling a single character in Inquisition just isn't as interesting as it is in ME3. Instead of switching between different weapons, managing your ammo, and dashing around between spots of cover, here you're mostly waiting around for the next cooldown to refresh. Inquisition also breaks up the action by having players explore a large dungeon. While this is an interesting idea, the execution leads to a lot of down time as you wander around a mostly empty environment looking for the next mob of baddies to kill. Multiplayer foibles aside, Dragon Age: Inquisition is a robust and immensely enjoyable game with hours upon hours worth of quests to explore. It smartly expands upon almost every aspect of its predecessor, creating an engrossing experience that lets you emulate some of the power and prestige of being a war general. Description The next chapter in the Dragon Age series, Dragon Age 3: Inquisition combines Bioware's well known storytelling legacy with deep RPG gameplay, all on a brand new RPG game engine.